The All-American Rejects formed in Stillwater, Oklahoma in 1999 although Tyson Ritter and Nick Wheeler had already bumped shoulders at a club. Bonds forged a demo called All-American Rejects was completed with original guitarist Jesse Tabish. The self-released Same Girl, New Songs EP was hand delivered at early gigs and is now incredibly rare and sought after. Signed to DreamWorks in late 2002 the self-titled Doghouse label debut whipped up a storm. Catchy, up-tempo material and occasional gusts of emo on downtime hit the mark with some reviewers comparing them to early Who and Beach Boys, though The Cars, Weezer and Replacements could be more pertinent reference points. Certainly key songs “Swing, Swing”, “The Last Song” and “Time Stands Still” kicked through the FM static and the recipe – cars, girls, angst and redemption struck a chord with their natural audience meaning that live shows became good natured riots. Lead single off second album Move Along was “Dirty Little Secret”, an escape from small-town blues that gives Green Day a run for their considerable money. Growing up in public and doing it fast did them no harm though and the album was a genuine breakthrough notching up double platinum. Howard Benson’s skillful production was vital in coaxing the best out of Ritter, Wheeler and new boys Kennerty and Gaylor. The title cut and “It Ends Tonight” have anthemic qualities and crossover charm. Try the International version for an acoustic version of “Night Drive” and the UK bonus track edition, “Eyelash Wishes”. Or, to hear them striding over the boards then hear the iTunes deluxe edition where you get five hits played live at the Wiltern, that lovely art deco theatre on Wilshire Blvd, Los Angeles. The esteemed Eric Valentine was called up to produce When the World Comes Down (2008) whose lead-off single “Gives You Hell” is their most successful release to date – 4xPlatinum and 4 million happy customers. They recorded this important song at George Lucas’s Skywalker ranch and made the main disc at Barefoot Recording. Decamping to remoter parts of North America in order to escape unwanted influences Ritter and Wheeler emerged with twelve fabulous items. “Another Heart Calls” features The Pierces and orchestration by Deborah Lurie and is one of the best things they’ve ever done: mainstream for sure but with bags of energy and an irresistible melody. Fans couldn’t get enough of this but not too worry: the iTunes/International deluxe edition, UK, Best Buy, Australian, Japanese and US bonus tracks versions offer various demos, live and remixed pieces and extra computer content to keep you entertained. Following a sequence of Remixes EPs the boys returned to the studio for Kids in the Street, this time working with Greg Wells (Adele, Katy Perry, OneRepublic, Mike etc.). Writing on the piano Ritter constructed All-American Rejects’ most ambitious set to date and managed to escape the constraints of teen pop cliché on the authentically bouncy “Beekeeper’s Daughter” – with its touch of high camp - the growing pains of “Kids in the Street” itself and the highlight piece “Heartbeat Slowing Down”, a sublime alternative to their norm with Mika’s angelic pipes filtering through the atmospheric backdrop. Having teased the fan base via his personal Twitter account it seems fair to say that a new track, “Into My Heart”, is about to drop and rumours of the next album – working title Calypso – are gathering momentum. The title song from the already mentioned movie Miss You Already could also be AAR’s to claim: called “There’s A Place” we can’t wait to hear it. Patience, patience and meanwhile take the time to discover this fine young band. Big hooks abound on this forceful debut by power pop whiz kids Nick Wheeler and Tyson Ritter. Though not yet old enough to legally buy an alcoholic drink in the year 2002, All-American Rejects are capable songwriters, accomplished vocalists, and skilled instrumentalists. Guitar-driven and underpinned with a humane-sounding drum machine cranking out frenetic backbeats, each cut on this self-titled debut brims with harmonies that recall the early Who and classic Beach Boys. Bolstered by the brash bar band bravado akin to the Replacements, the Goo Goo Dolls, and Fastball in all their ragged glory, All-American Rejects passionately render songs about girls, love, self-doubt, and youthful abandon. Cuts such as "Too Far Gone" employ a sympathetic orchestral backdrop, while tracks including "Drive Away," "My Paper Heart," and "One More Sad Song" prove that loud guitars and a broken heart make great rock & roll. 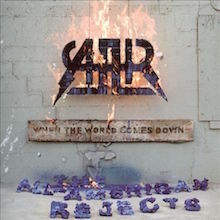 A talented band destined for great things, All American Rejects are primed to be embraced by the masses. The All-American Rejects' effervescent 2003 hit "Swing Swing" sounded like a pop-punk adaptation of Better Than Ezra, and their sophomore effort makes this mix even more apparent. The earnest racket of an outfit like the Get Up Kids is also a component in Move Along's sound. 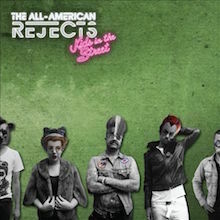 But the Rejects blend and sculpt those influences with keyboards, choirs, pianos -- there's even a classical guitar on "Top of the World" -- and the result is superficial midrange pop with appeal for a general audience of casual listeners. (Fans of Wakefield, Something Corporate, Switchfoot, and American Hi-Fi should take note.) the Rejects rock out a little on "Night Drive," "Dirty Little Secret," and "I'm Waiting" -- the guitars crackle anxiously, and Tyson Ritter and Nick Wheeler's breathy harmonies soar like they mean it. There's also distortion somewhere in "Stab My Back," but it's buried under acoustic guitars, vocal overdubs, and mournful keyboards. Move Along has some memorable hooks, such as those on the title track or "Change Your Mind" -- and, living up to its title, it moves along efficiently, usually keeping the pace at a snappy midtempo. The songs are also impeccably arranged, even if they're relentlessly processed and some of the instrumentation seems like overkill. (A children's choir? Come on....) In other words, it's easy to like The All-American Rejects if you're looking for 21st century mainstream rock that takes very, very few chances but does offer solid melodies and easy to swallow take/break and night/flight rhyme schemes. After releasing their charming debut, The All-American Rejects polished up their act with 2005's Move Along, a slick album that paired emo-pop anthems with spit-shine studio polish. Released three years later, When the World Comes Down reprises the same formula that made Move Along a success, from the blatantly commercial tracks (most of which hover around the 3:30 mark, that magical combination of minutes and seconds that seems to produce the most singles) to the use of auxiliary instruments. Strings, orchestral flourishes, and a female choir all beef up these 13 songs, which (at their root) are straightforward pop tunes about heartbreak, heartache, and other cheerless conditions of the cardiac organ. The extra instruments aren't always needed, but they do add an extra layer to the band's songwriting, which isn't nearly as intricate or impressive as the arrangements themselves. "Fallin' Apart" is fleshed out with piano and bowed strings, "The Wind Blows" finds room to house an entire orchestra, and "Another Heart Calls" pairs Tyson Ritter's vocals with the twangy lilt of the Pierces, whose cameo appearance is a bit odd (a folk duo on an emo album?) but still serves as one of the record's truly unique moments. 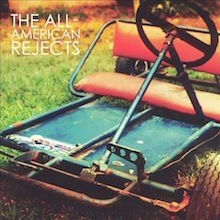 Elsewhere, producer Eric Valentine covers these tunes with a heavy coat of gloss, as if to pretend that The All-American Rejects' reliance on four-chord progressions is more interesting than anything by their likeminded peers. It isn't -- and that's the Rejects' main problem, since they tend to focus on presentation rather than execution. Of course, When the World Comes Down is nothing if not a commercial record, and any lack of distinction won't keep these would-be singles from finding a place on digital radio. Discerning fans may demand something new from the band's next record, however, since this is essentially Move Along with a revised track list. Four years on from When the World Comes Down -- and their fourth record overall -- All-American Rejects return with Kids in the Street, an album that simultaneously finds the emo-lite quartet maturing and embracing the sugar rush of pop. Certainly, Kids in the Street finds AAR performing with a musical dexterity they didn't quite have a decade earlier, when they were just kids creating big noise, seeming almost to stumble upon their hooks, whereas everything here is purposeful, a cleanly efficient machine churning out catchy, insistent pop spangled with hints of ‘80s synth pop. 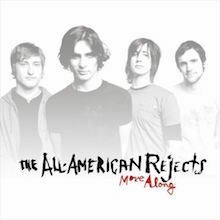 Such production flourishes add depth that the perfectly pretty introspective acoustic ballads don’t quite manage to muster, yet those slower tunes do highlight the range All-American Rejects achieve here, their richest and most varied album to date.